Turkeys may be started in much the same way that we recommend you start baby chicks. Start them on a medicated 28% Turkey Starter for the first 8 weeks. From 9 to 14 weeks provide them with a 20-21% Turkey Grower. 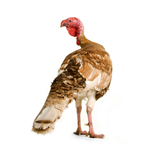 Finish your poults on a 16% Turkey Finisher ration. If you are unable to find "turkey feeds", start and grow your poults on a 20-22% Chick Starter (medicated) for the first 12 weeks. From that time on to the time of slaughter, provide them with an 18% Chick Grower ration. All rations should be medicated. Figure 3 inches of feeder space and 2 inches of watering space per poult to begin with. Expand that as needed as they grow older. Occasionally, customers have problems getting their turkey poults to eat and drink. In the event you might have chicks the approximate age as your turkey poults, consider putting 4-6 of them in with the newly arrived turkeys. The chicks will lead the turkeys to feed and water. Remove the chicks from the turkeys after 3-4 days. Never cover the litter with paper of any kind. If you do cover with paper, this can lead to "leg spraddling" problems. Finally, it is best to keep turkeys and chickens separated during the growing period. If this is not done, turkeys can pickup "black head" from the older chicken droppings. If your turkeys pick up black head, mortality will result.